ATEX Enclosures | Do you comply with the ATEX directive? Last updated on July 6, 2015 March 30, 2016 by Daniel Waldron for Armagard Ltd.
Did you know? Industry analysts recently found that 50 percent of all companies that are required to comply with the ATEX directive don’t even know what it is. This is your essential guide to ATEX and ATEX enclosures. After all, you could probably do without you, your business and your staff being blown to smithereens. ATEX is a European directive that was introduced in its fullness on March 1, 1996. On July 1, 2003 the directive was updated and compliance became a legal requirement across all European Union Member States. ATEX will be updated again on April 20, 2016. It’s in place to ensure that the use of electronic or electrical equipment, of any type, is certified for use in hazardous environments. Who does the ATEX directive apply to? If powders, dust, paint fumes or any substance that can ignite is present in the air in your facility, you need to be ATEX compliant. The directive is also applicable to companies, including Armagard, who design, manufacture and sell ATEX enclosures or any equipment which is intended for use in potentially explosive environments. The ATEX directive defines an explosive environment as a facility that has high concentrations of dust, gas, mist or vapour in the air, at levels that can cause a fire or explosion. The directive also takes into account electrical and mechanical sources of ignition. Employers are required to identify areas in the workplace where explosive atmospheres could occur. These areas are divided into zones, which are then classified depending on their size, the likelihood of an explosive atmosphere occurring and how long the explosive threat is present. Zone 0 – A place in which an explosive atmosphere consisting of dangerous substances in the form of gas, vapour or mist, mixed with air, is present continuously, for long periods or frequently. Zone 1 – A place in which an explosive atmosphere consisting of dangerous substances in the form of gas, vapour or mist, mixed with air, is likely to occur in normal operation on an occasional basis. Zone 2 – A place in which an explosive atmosphere consisting of dangerous substances in the form of gas, vapour or mist, mixed with air, which is not likely to occur in normal operation but, if it does occur, will persist for a short period only. Zone 20 – A place in which an explosive atmosphere, in the form of a cloud of combustible dust, is present continuously, for long periods or frequently. Zone 21 – A place in which an explosive atmosphere, in the form of a cloud of combustible dust, occurs in the air during normal operation on an occasional basis. Zone 22 – A place in which an explosive atmosphere, in the form of a cloud of combustible dust, is present in the air but is not likely to occur in normal operation. However, if it does occur, it will only persist for a short period. However, category 1 equipment can also be deployed in zone 1 and zone 21 areas. Category 1 and 2 equipment can also be used in zone 2 and 22 areas. 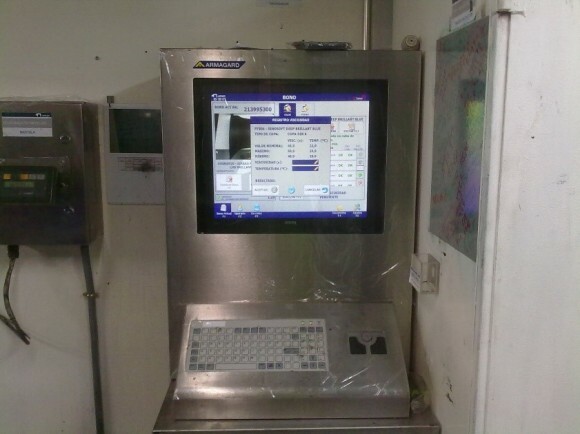 ATEX enclosures are the cost-friendly alternative to more expensive air purged computer systems, bringing you into compliance with the ATEX directive without bankrupting your business in the process. ATEX enclosures also come with the added advantage of flexibility. You can continue using your current equipment, and when that equipment comes to the end of its life you can replace it without having to replace the enclosure. The Armagard Intrinsically Safe, ATEX compliant enclosure is a prime example of a cost-friendly, flexible unit that’s suitable for potentially explosive environments. It’s recommended for facilities using computers and peripherals in explosive environments because such equipment is notorious for gathering dust. Dust, if left to gather, will cause a computer to overheat, potentially sparking a fire and in an explosive environment… well you get the picture. The Armagard intrinsically safe unit is not only ATEX zone 2 & 22 compliant, it’s fully waterproof and dustproof with an IP65 industry rating. Additionally, it’s manufactured using food grade (316) stainless steel and is delivered fully assembled, ready for use. The fact is, if you’re in a workplace environment that’s potentially explosive, ATEX compliance is a legal requirement. Protect your production line, protect your business and protect lives. 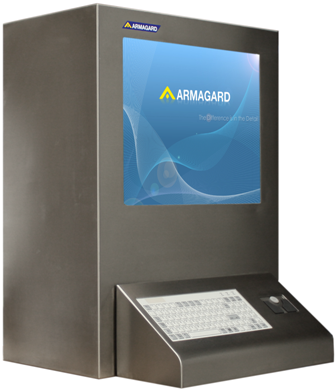 Order Armagard Intrinsically Safe, ATEX enclosures today. Call 0121 608 7226. Stainless steel PC enclosure – 304 versus 316 grade stainless steel, what’s the difference? This entry is filed under Industrial Enclosure. You can follow any responses to this entry through the RSS 2.0 feed. Both comments and pings are currently closed.